Welcome to Flash Fiction Friday and the fifty-third piece of flash fiction in this series. This week’s is a 410-worder by comic fantasy (“and a little horror”) author and interviewee Will Macmillan-Jones. It started in a bar, as do so many things. A dim-lit cellar, where the smoky jazz played by the house band drifted like the haze rising from the myriad of cigarettes. He had been coming to the bar for a couple of weeks, but had not made acquaintances there, not yet. Twice now, he had seen her across the room, her flowing blonde hair shimmering whilst the beguiling music played and the deep-voiced girl with the microphone sang slowly of love and loss, heartache and regret, and – yes – occasionally of passion and joy. Suddenly, as the music swirled sensually around, she was beside him at the bar. Their eyes met, and held in a long, long look before he turned away to order another drink. Disturbed, shaken by the casual intensity of her gaze, he trembled as she lightly placed her hand over his. “You seem to be alone,” she murmured in a velvet voice. He nodded. “So am I, tonight,” she said softly, then kissed him and took his hand in hers. Looking into her eyes his drink lay forgotten on the bar, as she pulled, with such tempting pressure, on his arm. Responding, he moved closer to her, smelt the subtle perfumes, entranced. As they moved away from the bar the bartender swept away the drink with a wry smile. “Where can we go?” he asked, a quiver in his voice. She answered with a smile that shivered his soul, and slowly licked her lips. Then turned, as he watched – but not for long – as she swayed out through a door marked ‘PRIVATE’. Without hesitation, he followed. Through the door lay a set of steps, leading downwards. A warm, dim glow lit the stairs, and reflected from her golden hair. His breathing became short now and he hurried forward, filled with anticipation and desire. Yet, he did not anticipate the figures that appeared behind him, and seizing him in their strong hands threw him across the cellar floor and onto the low altar that lay in the center of the cellar. Other, hooded ones took him, and bound him spread-eagled on the stone. Gently, they took his clothes, and left him naked. Wildly, he looked around as the hooded figures began to sway and move around the altar as they chanted in a strange tongue. His bowels loosened as She approached, crowned now with ivy, raising the sacrificial knife above her head, filled with anticipation and desire. Working as a professional tax consultant, he writes to escape the stultifying boredom of his job. 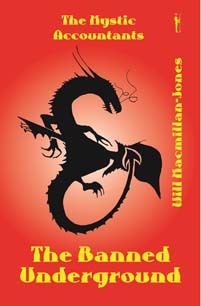 He has an irregular blog, www.willmacmillanjones.wordpress.com where he “rambles incoherently about writing”. His publisher’s website is www.safkhetpublishing.com. You can read my interview with Will here. The blog interviews will return as normal tomorrow with crime novelist Ann Cleeves – the five hundredth of my blog interviews with novelists, poets, short story authors, bloggers, biographers, agents, publishers and more. A list of interviewees (blogged and scheduled) can be found here. If you like what you read, please do go and investigate further. And I enjoy hearing from readers of my blog; do either leave a comment on the relevant interview (the interviewees love to hear from you too!) and / or email me. Unfortunately, as I post an interview a day (amongst other things) I can’t review books but I have a feature called ‘Short Story Saturdays’ where I review stories of up to 2,500 words. Alternatively if you have a short story or self-contained novel extract / short chapter (ideally up to 1000 words) that you’d like critiqued and don’t mind me reading it / talking about and critiquing it (I send you the transcription afterwards so you can use the comments or ignore them) 🙂 on my ‘Bailey’s Writing Tips’ podcast, then do email me. They are fortnightly episodes, usually released on Sundays, interweaving the recordings between the red pen sessions with the hints & tips episodes. I am now also looking for flash fiction (<1000 words) for Flash Fiction Fridays and poetry for Post-weekend Poetry.